On paper, Starship Titanic sounds completely fantastic. The game was conceived by Douglas Adams, not only one of the most well regarded comedy/sci-fi writers of our time, but also the man associated with The Hitchhiker’s Guide of the Galaxy, well known as one of the genre’s best text adventures. And yet, somewhere along the line, something went terribly wrong. The idea of Starship Titanic came from a throwaway line in Life, The Universe, and Everything, the third Hitchhiker’s book, which described a luxurious intergalactic cruiser that suffered from Spontaneous Massive Existence Failure (i.e. promptly disappeared into nothingness) on its first journey. Although not officially part of the Hitchhiker’s universe, the game picks up with that detail, as the Starship Titanic has somehow ended up right in the middle of your living room. You are invited onboard as its first (and only) guest to repair the ship, and try to figure out exactly what went wrong in the first place. The Starship Titanic is a gorgeous vessel. In keeping with its namesake, it has an astoundingly beautiful futuristic art deco design. The whole game is viewed from the first person perspective, with a single cursor to indicate movement and interaction. 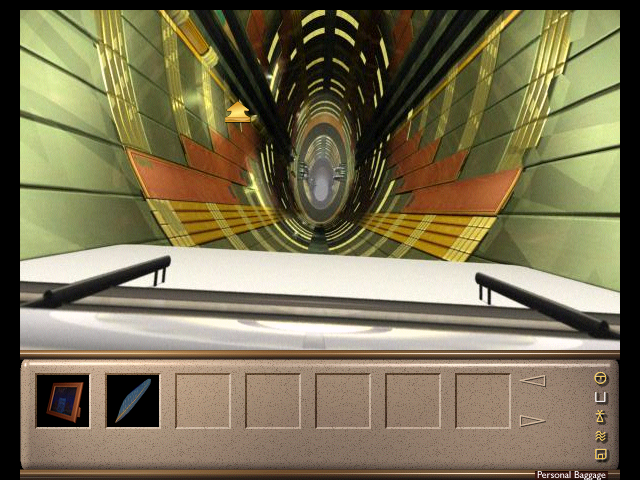 It’s a bit like Myst, with the computer generated graphics and all. 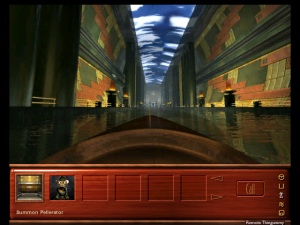 But rather than consisting of static screens, when you move from node to node, there’s a very quick transitional video that’s sped up and extremely blurry, as if you were stumbling drunkenly through the ship’s corridors. 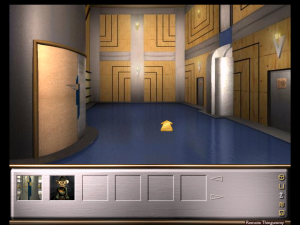 It’s actually pretty fun to watch, except for how often you’ll see them, since most of the puzzles revolve around ferrying items from one corner of the ship to the other. Beyond the initial embarkation lobby and a hallway that connects a few other areas, the staterooms are all accessed by elevators, and the rest of the ship is only accessible through a transportation vehicle called a Pellerator. While this was probably done to make the game world larger, and therefore more realistic, it also makes most of the ship feel strangely disconnected. And while you can skip through the short walking transitions by holding down the Shift button, you can’t skip the long elevator or Pellerator rides, which again, makes navigation remarkably tedious. 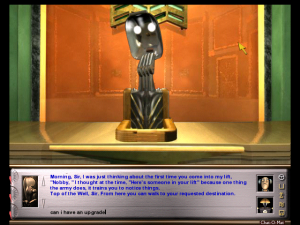 Once you get your bearings, your goal, at first, is to upgrade your ticket a few times to higher classes, and then eventually find all of the missing pieces of Titania, the computer that controls the ship. You’re never actually told this, though. Right at the beginning, you’re given a ticket and instructed to find your room, a task which is far more monumentally confusing than it should be. First you need to find the elevators, which are practically camouflaged the middle of the ships’ main hallway. Once you actually reach the correct floor, you need to find your room – not an easy task, because the rooms are not actually numbered. Instead, you need to walk up next to it and read the message at the bottom of the screen which identifies the room you’re in. 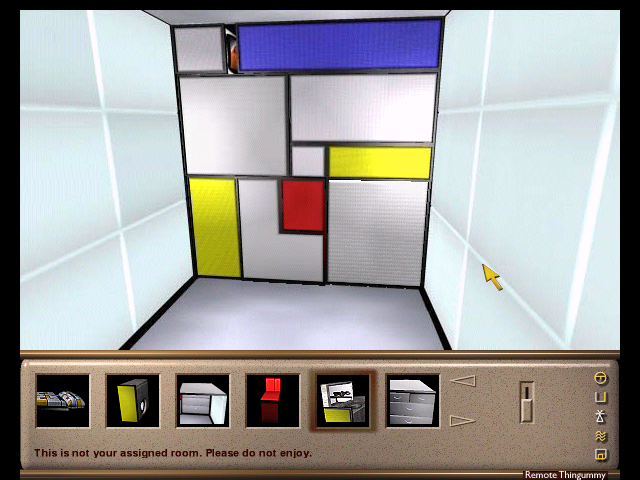 Whenever you enter any of the rooms, it tells you, “This is your Stateroom.” If you’ve entered the wrong room and try to interact with it, it will then immediately contradict itself and say “This is not your Stateroom, please do not enjoy.” It’s also not entirely clear, but the rooms are also stacked vertically, and there are elevators next to each door to take you between them. 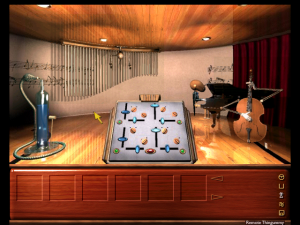 Once you’ve found the proper room, at this point you have the game’s first real puzzle, where you need to rearrange the pull-out furniture in a way that you can actually reach your TV. (Why you need to reach your TV isn’t entirely clear at first, but just roll with it.) But isn’t just getting to this point kind of a puzzle? It really shouldn’t be, because all you’re doing is struggling with the game’s vague sense of direction and halfway nonsensical structure. Starship Titanic also seems to hold a grudge against interacting directly with the environment. 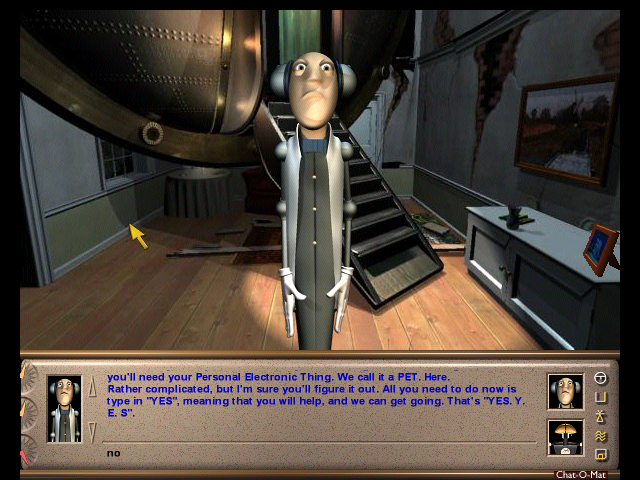 Unlike, oh, nearly every single mouse-driven adventure game ever made, you can’t simply click on an item to interact with it – instead, there’s a special part of the status bar, nonsensically dubbed the Remote Thingummy, which you need to pull up every time you need to, say, call an elevator. But even this is handled inconsistently, because some objects you CAN interact with directly, including items you need to pick up. For as beautiful as the ship is, you can’t interact with much of anything. What a complete waste! Douglas Adams was the master of creating strange and weird universes, with long and hilarious tangents on whatever weird bit of technology had evolved. This should have made for some excellent writing when looking at some of the odd stuff onboard, but nope. Nothing. The only characters throughout the entire game are the six robots that staff the ship. 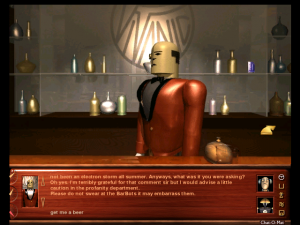 In keeping with the text parser roots of Infocom games, you speak to them by typing, theoretically opening up a whole world of amusing interactions. Of course, since all of the dialogue was pre-recorded, there’s no way you can hold an actual conversation with any of them. 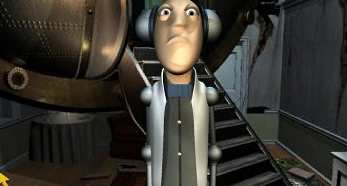 There are some funny bits, as the robots are quite well animated and are voiced by some very talented folks. The first time you tell them to “piss off” and they promptly walk off the screen without so much as a word, it’s a bit funny. But most of the time it seems they have no idea what you’re saying and just reply with one of their (many) “I don’t understand” responses, which are usually just random nonsense. Purportedly they hold the answers, or at least clues, to some of the more obscure puzzles, but good luck trying to pry any of that information out of them. 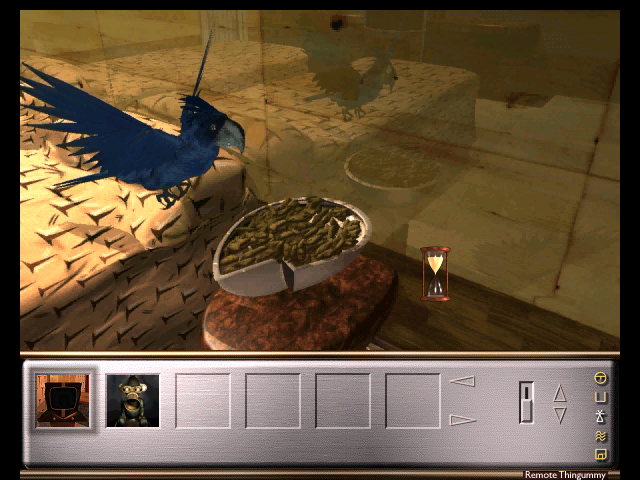 There is also a talking parrot, who spits out the same handful of phrases over and over. It’s voiced by Terry Jones, former member of Monty Python, and you haven’t gotten tired of his many shrill voiced woman characters (the SPAM lady, Brian’s mother, and so forth) you will now. John Cleese also supplies the voice of a bomb, which is largely harmless because it keeps distracting itself in the middle of its countdown. Its presence, outside of giving a job to a famed British actor, is largely pointless, as you don’t need to interact with it or even defuse it, if you don’t feel like it. There’s also an optional sidequest to uncover some e-mails to discover why the Starship Titanic is in such a sad state, but that’s the only semblance of plot you’ll find. 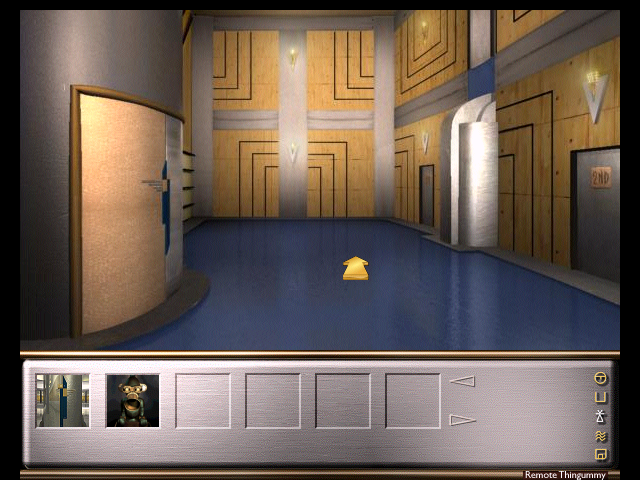 Most of the puzzles are a mixture between logic and inventory-based, but they all involve lots of running and fetching. At least a few revolve the use of the Succ-U-Bus, a huge, inter-ship series of pneumatic tubes which can transport items from one spot of the ship to another. Usage of these is also largely dependent on understanding how to program the key cards, which have different patterns on them denoting different parts of the ship. 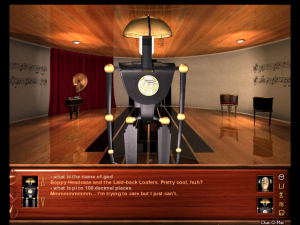 These puzzles aren’t too bad, but some become all the more difficult because of the reliance on the robots, and therefore the text entry. To create a certain drink, you need a broken television. You can’t actually pick up any of the many TVs yourself, though – you need to ask one of the robots to pick one up, carry it to a balcony, and tell them to toss it off. 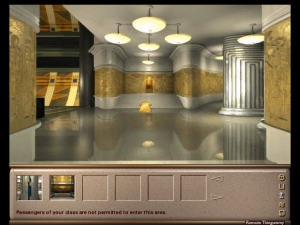 It’s puzzles like these that are meant to recall the days of text adventuring, but when you can otherwise interact with the world by a mouse cursor, moving outside of that feels incredibly incongruent, not to mention confusing. The publisher’s must have realized how confusing the whole package is, because they included a fairly large hint book (“$20 value!”) which, like the game itself, is badly structured, full of unnecessary information, and difficult to use. While most Infocom fans know Douglas Adams through the Hitchhiker’s game, he also penned a lesser known title called Bureaucracy, a journey detailing the perils of red tape. Starship Titanic sort of feels like that, that you’re caught in the middle of confusing and largely unnecessary set of procedures designed explicitly to frustrate you. There’s a lot of value to be found in satire, but it’s really no fun when it’s happening to you, especially when you’re playing a game you’re supposed to be enjoying, and perhaps have even paid money for. And when that aggravation is really the only source of humor… well, that is an issue. Most of this probably isn’t what Adams intended – there’s a lot of interjections from him in the strategy guide on his inspirations and ideas, and a lot of them sound pretty great. But they all got lost by the time it was coded into a game, and the result is an astounding disappointment. 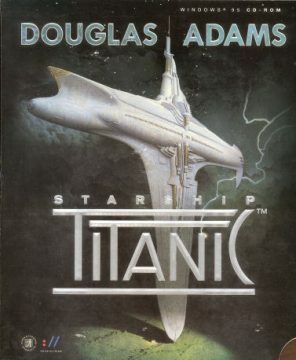 Starship Titanic was also turned into a novel, released around the same time as the game. 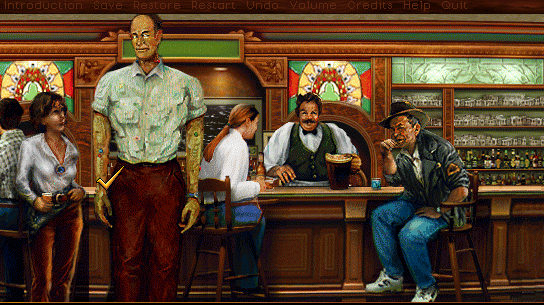 According to the foreward, Adams was too busy working on the game, so he got his pal, Terry Jones, to do it. There’s a bit more of a plot this time around, and some actual characters. The first 50 pages or so focus on Leovinus, the designer of the Starship Titanic, as it becomes clear that his beautiful creation has a number of snags. The story then begins properly when three humans end up on board. 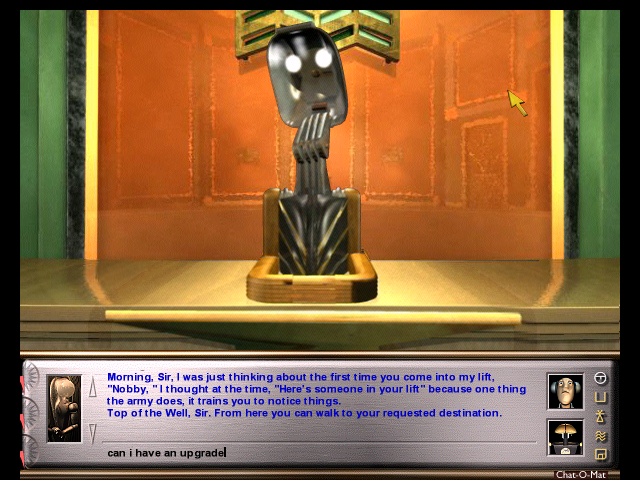 They’re joined by an alien journalist, and have a number of wacky adventures, some of which tie in with the game. 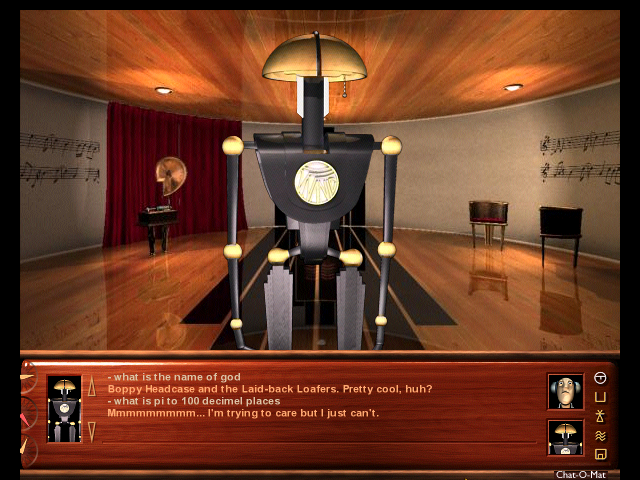 Some of the robots make appearances, as does the deranged parrot and the forgetful bomb. It does elaborate on the small bit of backstory that you can read in the game, but it’s missing Adams’ way with words, and is ultimately a bit dull.